Palm Beach is a hotbed of start-up bands and live entertainment — and some FAU students are getting in on the action. 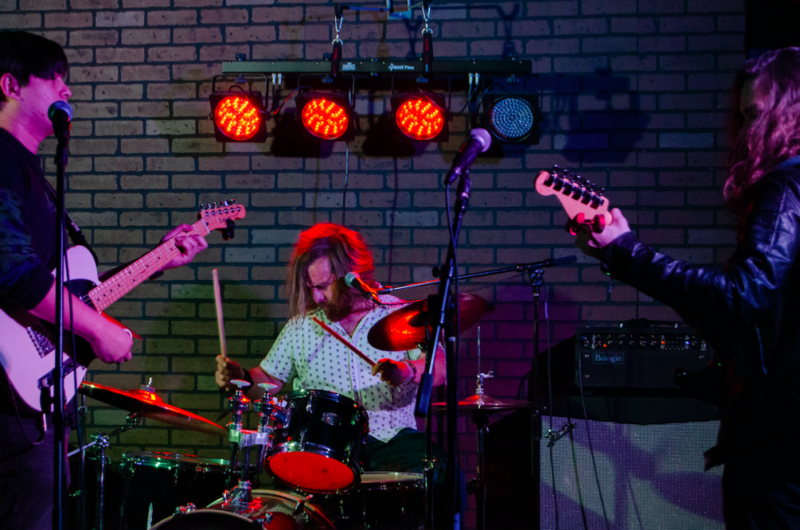 Two bands with FAU ties, Solar Reef and Toledo, are slowly making a local name for themselves. Here’s how they started, and where they’re going next. 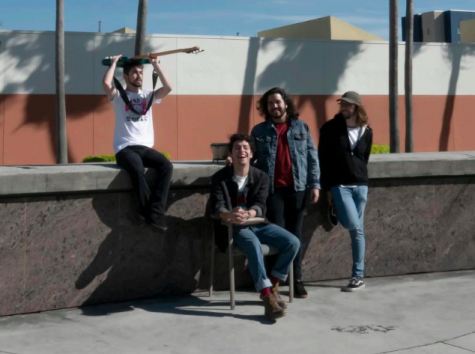 Editor’s note: This story has been corrected from our print issue to reflect that not all Solar Reef members work at School of Rock Boca, nor is it their official practice space — and that Bruno Medina is a guitarist, not a drummer. 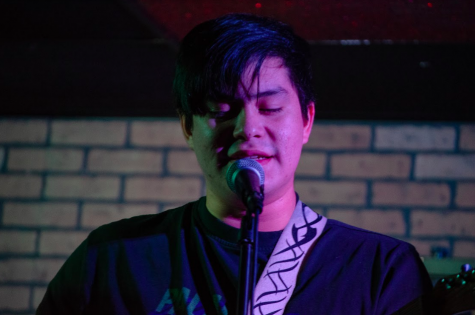 Bruno Medina, 24, scrambled to set up his art equipment at 1 a.m. His project for printmaking class was due the next day, and between his job and two bands, he couldn’t carve out the time to do it earlier. 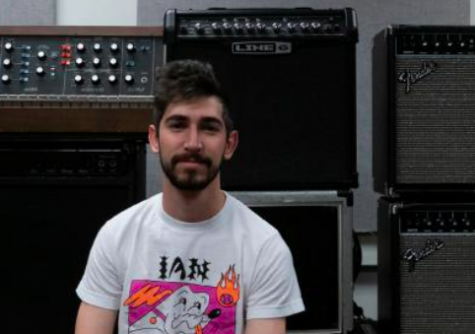 Both panicked and exhausted, the graphic design major called his bandmate, Mark Sipple, for backup. Sipple, a 23-year-old former FAU student, didn’t have the faintest clue about how to carve metal. But for his bandmate, Sipple rushed over from the cramped music studio he lives in and helped set up all he could. This was just one of many stressful late nights while juggling 12 credits and playing in a band. 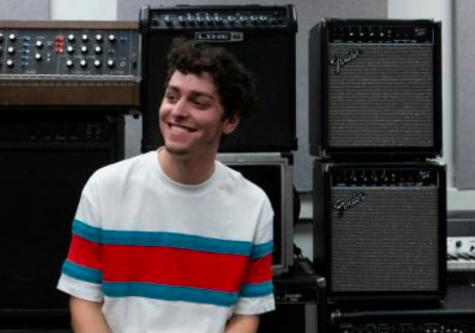 Sipple and Medina have worked on this balancing act for the single year their Boca Raton-based band, Solar Reef, has been around. 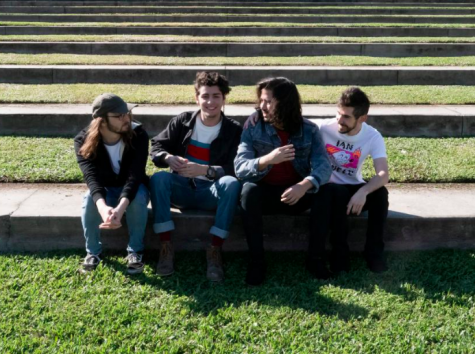 Solar Reef is an alternative band composed of Medina, Sipple, 27-year-old FAU film studies alumni Darek Bloch, and 26-year-old Palm Beach State College film student Juan Portillo. The four members’ roots are scattered across the world — but the diverse South Florida “progressive rock” scene has brought them together. Sipple, Portillo, Bloch, and Medina all love rock bands like Guns N’ Roses, Cage the Elephant, and The Strokes, as well as sipping Yuenglings during practice. Though connected by music and beer, their influences aren’t so connected from growing up across different regions around the world. Bloch, lead vocalist, grew up in Austin, Texas — the city whose motto has been “live music capital of the world” for 30 years. 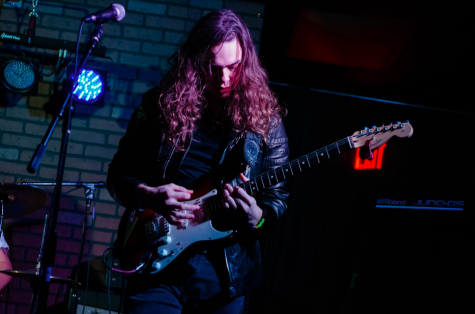 “I started playing at niche, small places true to my rock scene roots,” Bloch said about his time in Austin. The same holds true in Florida — Bloch’s favorite venues to play at with Solar Reef are O’Malley’s Sports Pub and Robot Brewing Company, he said. 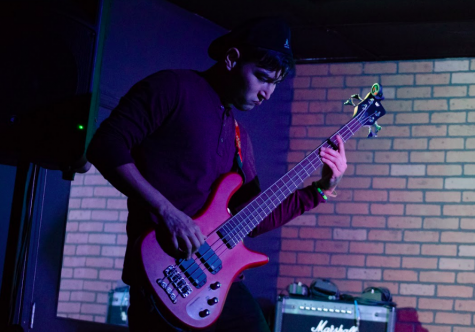 A bit west of Austin, Portillo, the band’s bassist, was soaking in the electric indie music scene in San Francisco — and began listening to Eminem when he was 11, he said. Each member has sacrificed things great and small for the sake of rock. For Medina, it’s assignments. For Portillo, it’s sleep. For Bloch, it’s money for a guitar tattoo on his left shoulder. For Sipple, it’s a house with a bedroom. 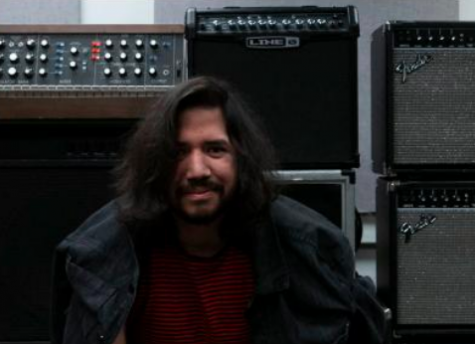 Solar Reef’s latest rock single, “Wine,” is a deft exhibit of the four’s crafts. It begins and ends with polished riffs from Sipple and Medina on guitar and Portillo on bass, with Bloch’s complimenting voice and dynamic drumming tying the whole song together. Their occasional gathering space, the School of Rock, is a small stage with a pair of leather couches facing it. The School of Rock is a nationwide company that offers music lessons to people of all ages — and Bloch is the general manager of the Boca Raton location five minutes from FAU. Sipple and Bloch work there by day, and bring new songs to life there by night. Though the burdens of being a student while chasing dreams of becoming a household name are heavy ones — like finishing projects at 1 a.m. — the journey is always worth it. Check out their music here, and an upcoming album early this year. Editor’s note: This story has been corrected from our print issue to reflect that Toledo’s EP will not be coming out in January but another time in the future. Toledo played in a dimly-lit bar that reeked of smoke and spilled beer this past December. Despite that and the low turnout, the band from Boca Raton managed to play with high energy. 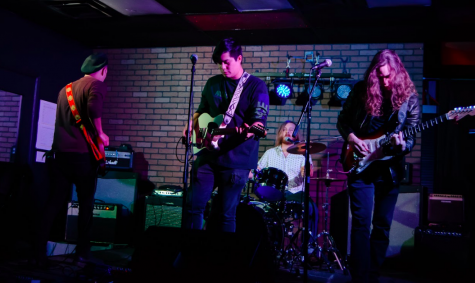 Toledo consists of four members: 23-year-old lead vocalist and guitarist Brendan Lyons, 21-year-old bassist Brian Ferguson, 22-year-old drummer Matt Bielasiak, and 23-year-old guitarist Diego Vasquez. They all love Weezer, and cite the alternative indie band as their biggest influence and a catalyst for their friendship. All except for Vasquez are currently FAU students. Every show usually features a cover of “El Scorcho” from Weezer’s album “Pinkerton,” which is one of the band’s biggest hits. “If you say “El Scorcho” in the mirror three times with the light off, Toledo will show up in your bathroom,” Lyons joked to the audience during the December show. Some of the band members knew each other way back. Lyons and Vazquez have been playing together since they were 15 and going to high school in Broward County. Lyons later met Bielasiak at Solid Sound Studios, a recording and rehearsal space in Pompano Beach. Bielasiak wasn’t a huge fan of Weezer at first, but the others converted him quickly. Ferguson was the last one to tag along, meeting Lyons and Bielasiak in a music class at FAU. 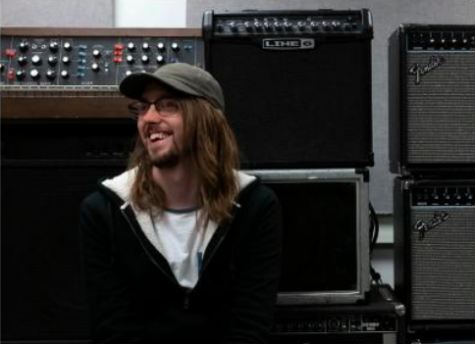 “The first day of school, I heard Brendan talking about Weezer and My Bloody Valentine and I was like ‘hey, woah…,’” Ferguson started. “It looks like we’re going to be friends,” Lyons finished. 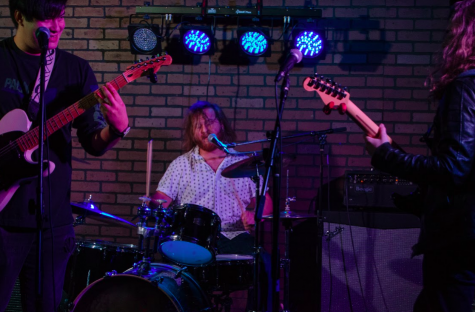 When it comes to live performances, Toledo has played their fair share of interesting shows — one being a Halloween-themed gig in Beer Punx, Fort Lauderdale where the band dressed up as various music icons like Kurt Cobain and Freddie Mercury. Between sets, the band makes small talk. During their New Year’s show at a venue called Robot Brewing Company in Boca — which is also where they played their first show ever — Ferguson and Bielasiak made jokes about their merch while Lyons changed his instrument in-between most of their songs. Their last EP named “Either Way,” came out in October 2017. It’s marked with fireworks, but paired with soft, indie rock, courtesy of Weezer’s influence. However, their next EP may be a little different. Check out Toledo’s Bandcamp and listen to their music here. Kristen Grau is the features editor of the University Press. For more information regarding this or other stories, email [email protected] or tweet her at @_kristengrau.